Breakdown: Seeing as the 8K isn’t a particularly common race distance, holding the title of “World’s Largest 8K” might sound like a questionable claim to fame to some, but the Bank of America Shamrock Shuffle, often cited as the start of Chicago’s running season, is no small shakes. 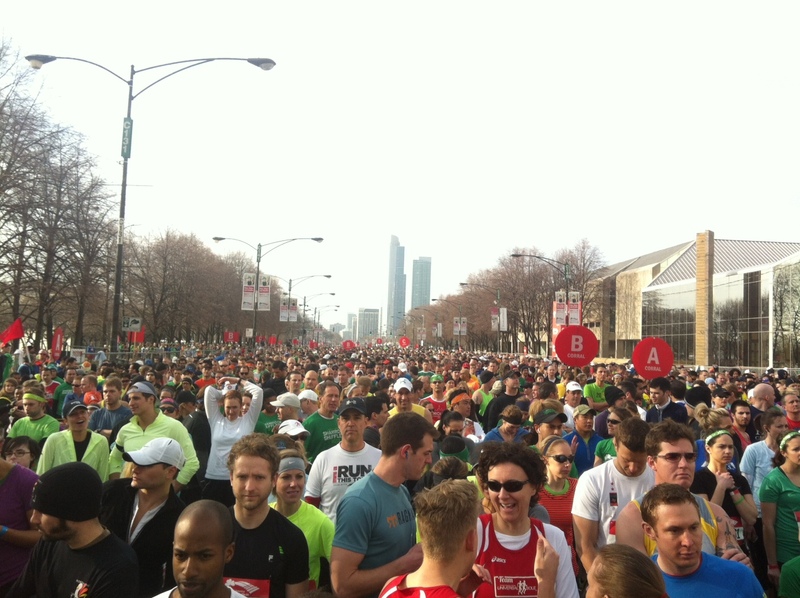 With a sold-out capacity of 40,000 runners, the Shamrock Shuffle is not only one of Chicago’s largest racing events, but ranks up there with the largest racing events in the world. For the second year in a row, race organizers took the wise, though somewhat controversial (last year, at least) step of separating runners out with two start times (8:30am and 9:15am), effectively fielding two races with 20,000 participants each rather than one gigantic field. And for the second year in a row the decision proved beneficial. Though it’s certainly preferable to be a part of the first wave, it’s always preferable to have more open space on the course. Additionally, corrals were easy to get into and the two waves were clearly delineated by the color of the running bibs. The course winds through downtown Chicago, giving runners impressive views through blocked-off streets with ample volunteer (and crowd) support. This year’s race benefited from a sunny spring morning that felt warmer than its forty-eight degrees. Basking in the sun with a free beer in hand at the post-race party, taking place in Grant Park in the area around the Buckingham Fountain, it’s easy to see how the Shamrock Shuffle earned its reputation over the last thirty-four years as a herald of outdoor races to come. Course: Like a miniature version of the Chicago Marathon course, the Shamrock Shuffle starts and finishes in Grant Park, beginning by heading north under the BP Pedestrian Bridge and finishing off with Chicago’s (miniature) version of Heartbreak Hill on Roosevelt. An impressive tour of downtown Chicago on foot. Organization (gear check, etc. ): Information is organized and well-communicated and volunteers are out in force keeping things moving. The logistics of coordinating a downtown course and 40,000 runners (from pre-race lineup to post-race party) are expertly handled here. Some may complain about the pre-race packet pick-up only being available at the Navy Pier expo, but that’s part of the experience. Goodie Bag (includes shirt): Despite a virtual goodie bag with plenty of offers, the actual goodie bag still consisted of a number of paper ads—coordinators should choose whether to go virtual or not and commit to that. The shirt is green again this year (after last year’s red shirt got Shamrock purists up in arms). A free beer at the post-race party is included on the race bib.